Delayed approval of the budget, audit of books, accountability efforts and revenue sharing would hamper service delivery, ICPAK said. Accountants want President Kenyatta to constitute a selection panel to appoint the successors of the Auditor General and the Controller of Budget whose tenures expire in August. 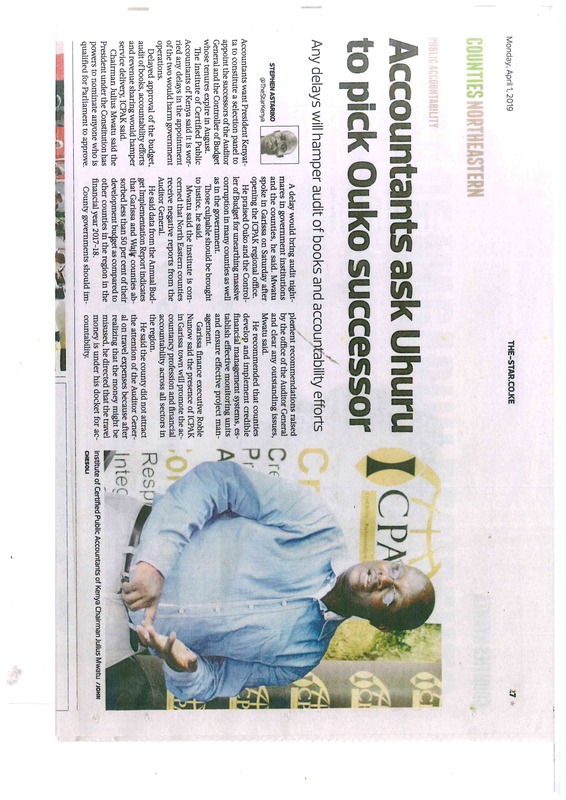 The Institute of Certified Public Accountants of Kenya said it is worried any delays in the appointment of the two would harm government operations. Chairman Julius Mwatu said the President under the Constitution has powers to nominate anyone who is qualified for Parliament to approve. A delay would bring audit nightmares in government institutions and the counties, he said. Mwatu spoke in Garissa on Saturday after opening the ICPAK regional office. He praised Ouko and the Controller of Budget for unearthing massive corruption in many counties as well as in the government. Those culpable should be brought to justice, he said. Mwatu said the institute is concerned that North Eastern counties receive negative reports from the Auditor General. He said data from the Annual Budget Implementation Report indicates that Garissa and Wajir counties absorbed less than 50 per cent of their development budget as compared to other counties in the region in the financial year 2017-18. County governments should implement recommendations raised by the office of the Auditor General and clear any outstanding issues, Mwatu said. He recommended that counties develop and implement credible financial management systems, establish effective monitoring units and ensure effective project management. Garissa finance executive Roble Nunow said the presence of ICPAK in Garissa town will promote the accountancy profession and financial accountability across all sectors in the region. He said the county did not attract the attention of the Auditor General on travel expenses because after realizing that the money might be misused, he directed that the travel money is under his docket for accountability.